Updated information on Monday's Tesla Model S fire clarifies that the battery pack caught fire, and that Tesla's battery pack design limited the spread of the fire, limiting the damage risk. This is the event electric vehicle activists hoped would not happen, an electric car with its battery clearly on fire. In yesterday's initial reporting of the Tesla Model S fire in Kent Washington on Tuesday, it wasn't clear what caused the fire. Since then, an incident report surfaced from the Regional Fire Authority of Kent, Washington, making it clear the battery pack did caught fire, and that it took fire fighters several attempts to get the fire out. The incident also demonstrates that Tesla's battery pack design safely contained the fire to one segment of the pack, limiting the scope of the fire, and allowing the passengers to exit the vehicle safely. The incident occurred at 8 AM Tuesday morning on Washington State Route 167, in Kent Washington, outside of Seattle. The Model S hit a large metal object on the road, which was detected by safety systems on-board the Model S. The safety systems warned the driver to pull over safely, and the driver took the next off-ramp. By the bottom of the ramp he started smelling smoke, exited the vehicle, at which time it caught on fire. Kent Washington fire department was on the scene within a few minutes. According to a report from the fire department, obtained by ibtimes.com, fire-fighters first doused the fire with water, but it re-ignited. The water seemed to intensify the fire, rather than put it out, which is consistent with other research into lithium battery fires. They used a dry chemical fire extinguisher, which put out most of the fire. Eventually the fire crew had to use a "high lift jack" to raise the car, punch holes in the battery pack, and extinguish the fire inside the pack. This is consistent with the fire being located in the main pack. The Tesla Model S battery pack is designed in segments with fire-proof bulkheads between each. These bulkheads appear to have prevented the fire from spreading to the whole battery pack, because the fire was contained to the front of the car. The battery pack is situated beneath the entire length of the passenger compartment, which would have engulfed the entire car if the entire pack had become involved in the fire. Some of the reporting on this incident shows over-the-top hype over what amounts to a car fire. As a society we have accepted the risk of driving cars containing tanks full of highly explosive flammable liquid, and accept that risk so completely that gasoline car fires go unreported despite there being hundreds or thousands of fatalities a year. The facts demonstrate that electric cars have a better fire safety record than gasoline cars. Over the past 15 months, when first the Model S was delivered to a customer, Model S vehicles have driven over 83 million miles. 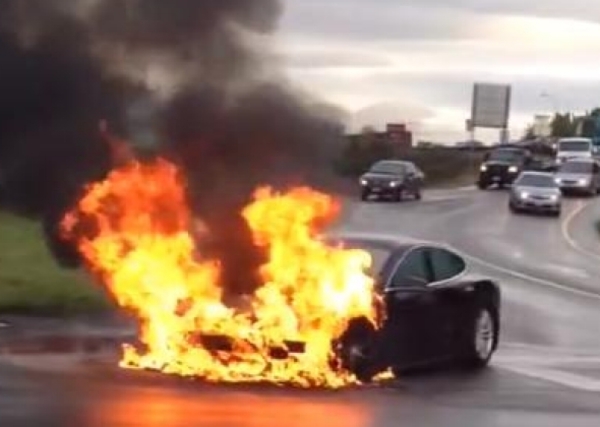 There have been dozens of traffic accidents involving Model S's, yet only one car fire. Additionally, there have been no car fires involving the Chevy Volt (in the wild), the Nissan Leaf or any of the other electric cars currently on the road. The one other electric car fire was a Chevy Volt, three weeks following an NHTSA crash test. The rate of gasoline car fires is much higher than this, nearly 200,000 a year. Which is safer? The gasoline powered car or the one with the battery pack? On Monday, the Tesla Motors (TSLA) stock price nearly reached $195 a share. Since the news of the battery pack was released on Tuesday, TSLA's price has slid to $175 a share, as of this writing, for about a 10% decline.